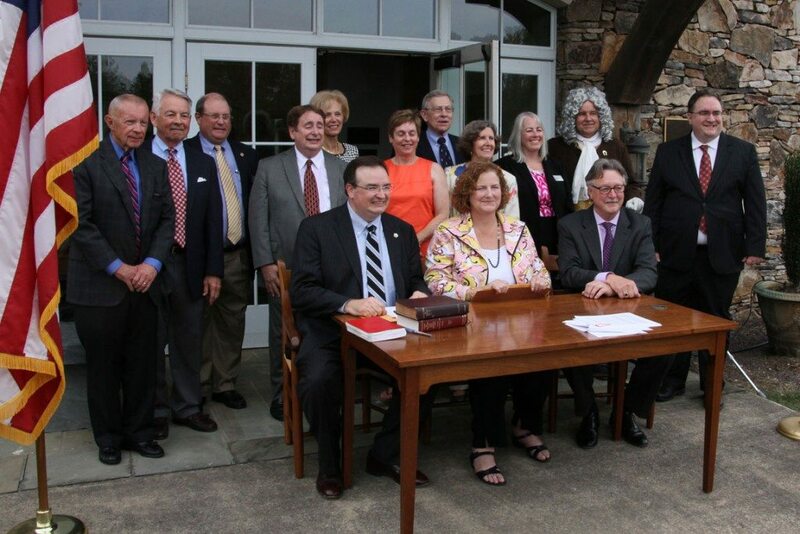 On Thursday, October 3, 2013 in front of the Germanna Foundation Visitor Center in Locust Grove, Virginia, Richard V. Hurley, President of the University of Mary Washington, and J. Marc Wheat, President of the Germanna Foundation, signed agreements for cooperation between the two institutions to transfer the 62-acre Fort Germanna and Enchanted Castle archaeological site from the University of Mary Washington to the Germanna Foundation. Kathleen S. Kilpatrick, Director, Virginia Department of Historic Resources, was present to speak about the strategy the Germanna Foundation is undertaking to forever protect where Germanna’s families became American. As Wheat, Hurley and Kilpatrick signed the papers, the Germanna Foundation Trustees stood behind them to witness this important and historic event, 58 years after the Foundation first tried to acquire the land. Afterwards, children rang the bell in the Foundation’s Memorial Garden and a reception was held in the Visitor Center and Library.